An incident recently occurred on the I-10 highway in Texas where a truck driver lost control of his vehicle, causing it to tip over and catch fire on a highway embankment. The El Paso Police Department stated that the driver, who works for White Mountain Trucking, had reached for a bottle of water, leading to the semi-truck falling onto the embankment and catching fire. An explosion was heard around the city, according to witnesses. Amazingly, the driver escaped from the truck's cabin with only minor injuries and has since been taken to a nearby hospital for treatment. 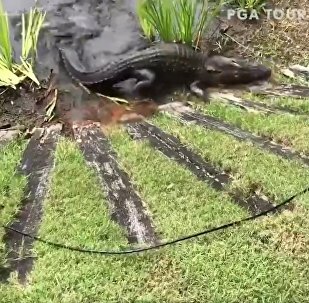 An alligator has attacked a snake during the professional golf tournament Zurich Classic of New Orleans. The incident occurred at the Jefferson American County Golf Club in Louisiana.